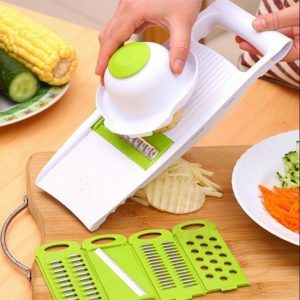 A slicer will come in handy when you want to cut your vegetables thinly and finely. Slicing onions, radishes, potatoes, cucumbers are given, but some products can even shred, chop, grate, or serrate with them. There are products that can cut bread too, aside from the usual vegetables. We will show you the pointers in choosing slicers and show you the most popular items in rank order. Brands like Cocotina and Paderno have their own special slicers, those with a protector for safety, or electric slicers for easier cooking experience will be part of the list! Keep in mind the pointers in choosing and find the perfect slicer for you! To find the perfect slicer for your cooking style, you would need to check the pointers in choosing slicers first. Slicers can be divided into “electric type” and “manual type”. We will explain each type’s pros and cons, so please try to analyze which type will be best for you. 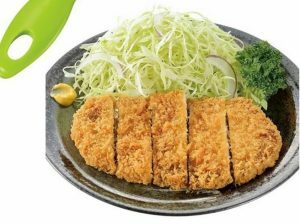 The electric type can slice the ingredients automatically, highly recommended to those who want to slice a lot of ingredients. You won’t need to exert any effort so naturally you won’t get tired, and there is no need for you to touch the blades making it safer to use too. Although it is bigger in size with lots of parts, it can be harder to clean and to store. The affordable and compact manual type, is perfect for those who are looking for something that can be easily be bought and used, or those who only need to slice few ingredients. The manual type is more compact than the electric type with comparatively fewer parts, it is easier to clean and store. Though you need to be very careful when using it, as it can cut your hands if you touch its blades accidentally. You would need to exert force too, especially with harder ingredients, so we can’t recommend it to those who need to slice a lot. Choosing a wider slicer is the important point in choosing an easy-to-use slicer. Small slicer is unstable making it harder to exert force, and will require you to cut the ingredients into smaller size first before you can use the slicer, resulting in extra work and waste of time. It will be best to choose a bigger slicer so you can exert force with ease and will help you save time. 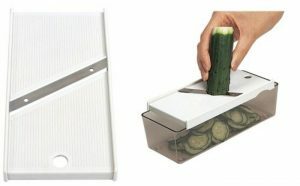 Slicers that are too big will then become harder to store! Check first your storage space before purchasing and choose the perfect sized slicer! Slices nowadays have a lot of ingredients it can cut. Cabbages and carrots are out of the question, but there are products developed to cut eggs, bread, ham, butter, and other ingredients. Imagine the ingredients you need to slice often, and check the product description for the corresponding ingredients it can slice. 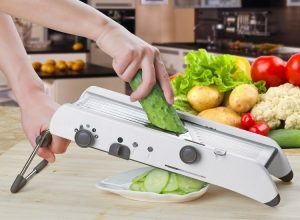 Slicers’ sharpness will all depend on its blades. To keep its cutting quality at its best, make sure to choose the blade that is rust resistant and durable. The most common blade material is stainless, but there are products that use ceramic blades that are very durable, highly recommended to those who are looking for slicers with higher quality and sharper cuts. If you are looking for electric type, check too if the blades can be replaced. Lastly, we will show you the slicers’ additional features that can come in handy. A protector that can keep your fingers off the blade, the adjustable thickness, and a lot more features depending on the product. Choose the slicer with the additional feature that will match your cooking style! You really need to be cautious not to cut your hands or fingers when using a manual type slicer. 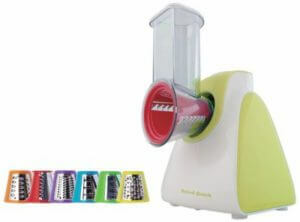 Especially if your kids will use the slicer, it is important to choose the product that is safe. We recommend slicers that have a protector. You just need to use the protector so you won’t need to hold the ingredients by your bare hands, making it safer to slice them even after they’ve become smaller. You can slice them up to the last inch too, and small pieces won’t go to waste anymore. Choosing slicers with adjustable thickness will make it possible to cut different ingredients with just one product. Most products will allow you to adjust thickness without changing parts, keeping it still compact when storing. Thickness can be adjusted by levels with most products, it will be better to choose products with more levels if you are looking for a more versatile slicer. Slicing and shredding are one of the most common cutting styles, and some products can also cut ingredients into cubes, spiral shape, or cut them like a string. Think about the dishes you want to cook, and choose the product that can cut your ingredients in the shape you want. There are products with accessories or attachments that will let you create more varieties in cutting your ingredients too! Make sure to check them out! Now we move on to the slicer ranking. Hope you can find the perfect slicer for you! 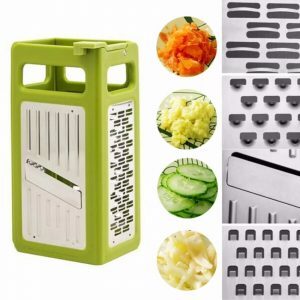 This slicer/grater has a different blade on each of its sides, so you won’t need to replace the blade every time you want to change the cutting style and you just need to rotate it to use the blade that you want. You can fold them flat and easily store them very compactly. Though you need to be very careful when using it because all blades are exposed and a higher risk of cutting your hands while using or washing. This product is very affordable and comes with 4 stainless steel rust resistant blade that will cut and slice your ingredients effortlessly. 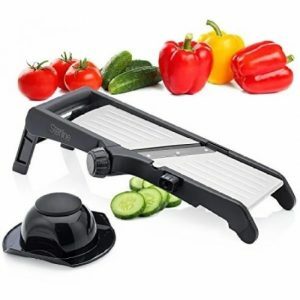 It also has a hand guard protector, this product is perfect for cooking beginners who are looking for a simple slicer for their home. You can store the blades underneath its body, for neater and more compact storage. Highly recommended for those with limited storage space. 5 Blades with 11 Cutting Styles! This product has 5 blades that you can experiment with, and enjoy its 11 possible cutting styles. It also comes with a container that catches everything you slice for neater and easier cooking after you’re done with cutting the ingredients. It is very affordable too, with a lot of useful features that can be great as gifts for friends and relatives. Though reviews mentioned that the blades are quite thin, and it was difficult to cut hard vegetables like carrots. 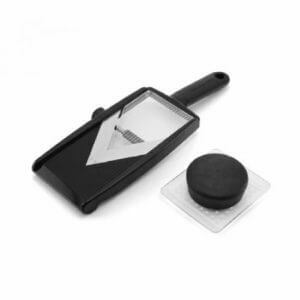 This product uses a wide surfaced blade that can help you slice or grate your ingredient faster. 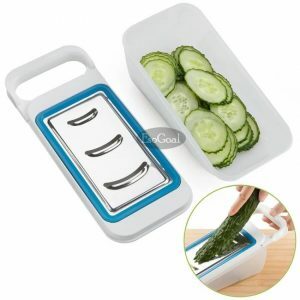 It also comes with a tray to neatly catch your sliced ingredient and this tray will also serve as your blades’ storage after use. It is very simple to use and very affordable for its quality and added features. You can depend on it for long-term use too, as the reviews commended on its rust-proof blades. 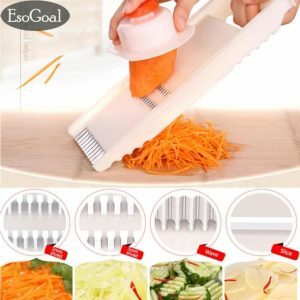 This product has a very sharp and strong blade that can cut through very hard ingredients such as sweet potatoes with ease. The ingredient holder has a soft rubber non-slip grip making it easier to exert force and easier to control for safer use. You can change the thickness without changing the blade itself, and this product’s durability is also commended by reviewers. 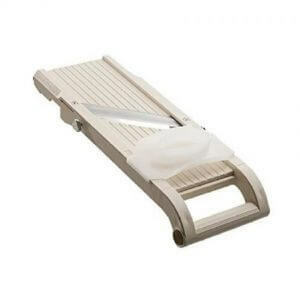 A very durable standard slicer that we recommend can to every household. This brand from Japan is well known around the globe for its high-quality kitchen tools and supplies. 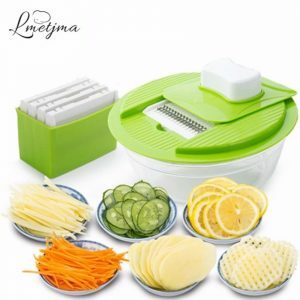 It has a wide body big enough for bigger ingredients/vegetables, with a non-slip rubber base making it more stable during use. You can also hook it on your bowl for more stability while slicing. The price can be a bit expensive for household use, but you can use it for many years since the blades are also sold separately so you can replace them at any time, perfect for those who are looking for slicers that are for long-term use. 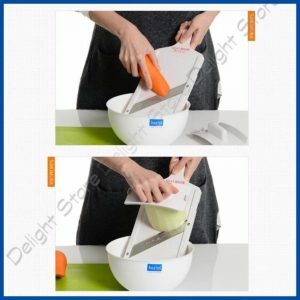 This slicer is attached to a big capacity bowl for two useful reasons: to make it more stable while you slice your ingredients, and so you can serve what you just sliced inside that bowl. You won’t be needing an additional bowl to wash, and can be very useful for big families who use a lot of sliced vegetables in one meal, or for those who eat salads as their main dish! You can store all the attachment blades inside the bowl, but the bowl itself will take up some space, so if you have limited storage this might be a problem for you. 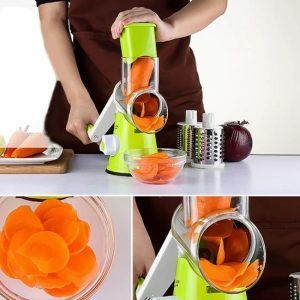 This product requires almost no effort, you just need to rotate the handle when slicing ingredients. The blades are completely covered making it very safe to use, highly recommended to families who love cooking with their kids, and even safe to use by the elderly. The design is more complicated than the orthodox slicer, making cleaning a bit harder but the benefits you get from it is more than worth all the cleaning efforts. Slicers are simple cooking tools, and using it with your own original ideas will make it more useful. We will explain here the ways to use your slicer, hope this helps! Slicers have exposed blades on them, making it more prone to cuts and injuries. You can easily cut your fingers or your palm while using it. Please keep in mind the following points when using the slicer, for a safer cooking experience. 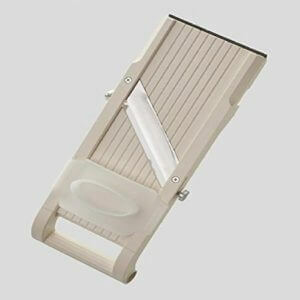 As we have explained previously in the buying guide, it is very important to use a protector to safely use your slicer. By being in between your hands and blades, it will prevent your hands from being cut. Though it is very dangerous if you are not using the holder properly. The food can slip and fall off, or it can be easier to cut your fingers when not properly used, so make sure to read the instruction manual before using them. The safest way to use a slicer is to use a protector, but there are still a lot of products that do not include a protector. If you won’t be using a protector, pay attention to the ingredients’ size, and if they become small, avoid using them anymore. Even though you are slicing big ones, there is a possibility that a bigger portion will be cut off unexpectedly when you exert a strong force while slicing. 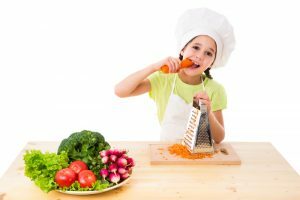 A big ingredient does not necessarily mean it is safe to cut, so make sure you are focused when using a slicer, and that the force you are exerting is just food enough. Vegetables should basically be cut in line with their fibers, but changing the angle or the position of the ingredient will result in a different shape. Try these recommended cutting styles depending on the ingredient with your slicer! 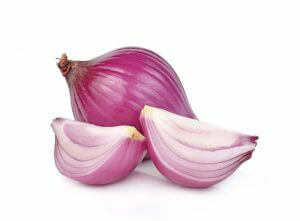 Onions will turn into different shapes just by changing the way you place it on your slicer. If you put the side you cut on top of the slicer, you will get the regularly sliced onions. If you place the sides on the slicer, you will get shredded onions. You can use these differently sliced onions on different dishes, or cut one onion in different ways. Try experimenting with onions and design your dish! 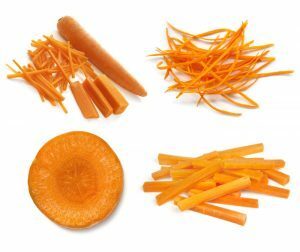 If you want to shred carrots and you don’t own a shredder, you can slice them up first, and compile them together and slice again from the sides. Make sure to use holders so carrots won’t fall off as you might cut your hands. If you want to cut it like noodles, we suggest using a peeler. You will be able to make carrot pasta similar to tagliatelle. The technique in making fluffy shredded cabbage is to make sure you don’t press it too much. Gently slice them like you’re mixing the air into the shreds. Basically, you would need to cut the cabbage so it can fit your slicer, but if you cut it too small it can be very dangerous. Make sure you will leave the core when cutting so the leaves will stay together. 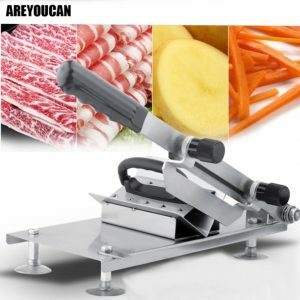 If you use a meat slicer, you will be able to make thinly sliced meat just like in the restaurants. It will be more budget-friendly too if you buy lump meat. You can also make your own meat slices with your favorite meat part. Fresh meat is harder to cut, beginners should try cutting frozen meat first. We introduced the top 10 recommended slicers online, how was it? 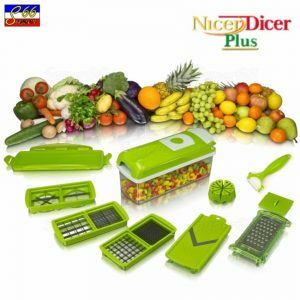 The slicers we’ve introduced are all great products. 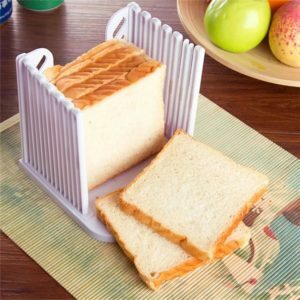 Hope you can find the perfect slicer for you to make your daily dishes more fun to make and more entertaining to look at.